There’s truly something about these wine puns that just feels so sophisticated, but silly at the same time. Little did you know, puns pair very well with wine so for your reading delectation, we’ve compiled the most di-vine collection sure to follow a barrel of laughs. 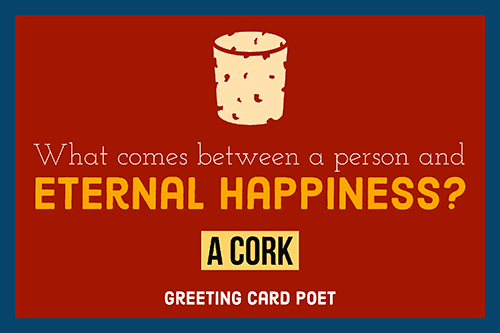 Like the drink, the following puns come in all varieties and can be very popular at parties or small gatherings. Try your hand at giving these a good swirl around, and you might discover your palate is actually more diverse than you thought concerning the humor of these silly wine puns. What do you call a mammal that loves merlot? How did the cabernet feel after its performance? What did the male wine say to the female? Why wasn’t the man scared to talk to the lady in the wine bar? Because he had liquor courage. Why are cab bottles scared of vampires? Because they know they like feasting on necks. What did the Merlot say after a long day’s work? Time to uncork and unwind. What did the happy red wine say to the sad white? Unlike milk, when is it okay to cry? What is a Merlot’s favorite thing to eat for breakfast? What do you get when you cross red white and a lion? A wine bottle that isn’t afraid to show its loud pour. What did the doctor tell the cupboard? Why did the grape get sent to the principal’s office? Because it was always whining. Where do grapes go for breakfast? How do you make a sauvignon blanc bottle open up to you? You have to uncork it first. How does James Bond like his wine? What do cabernet sauvignon bottles ride for vacation? What is a grape’s favorita day? What comes between a person and eternal happiness? Why did the cheese and vino become good friends? What did the merlot bottle yell when he jumped in the pool? 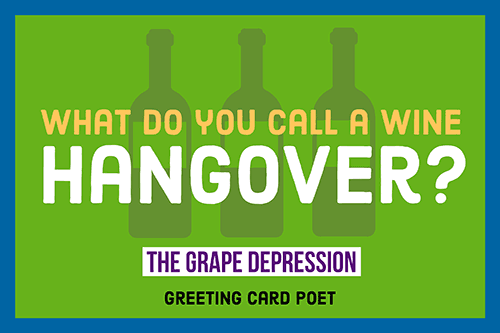 What do you call a wine hangover? Why were the grapes in the kitchen so rotten? Where did the Merlot say it heard the rumors? Why is every box of raisins a tragedy? Because they were grapes that could have been wine. How can you tell which of the wine tasters is visiting a place for the first time? By the blanc look on their faces. Why were there so many complaints about the service at that banquet? Because the server of the wine did a pour job. Where do people lock up their drinks? What happened when the man drank too much vino? He ended up getting a cab. Why was the grape so sad? Because he had been crushed. Why aren’t grapes ever lonely? Because they come in bunches. What is purple and long? What’s purple and huge and swims in the ocean? If white wine goes with fish, do white grapes go with? What kind of dog did the winemaker have? 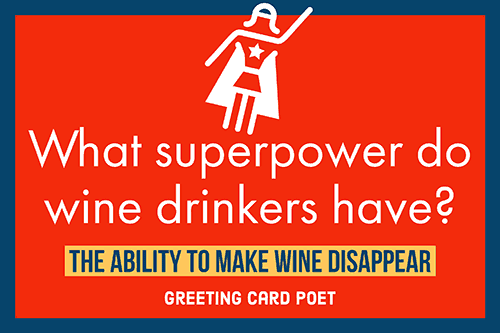 What superpower do wine drinkers have? The ability to make wine disappear. 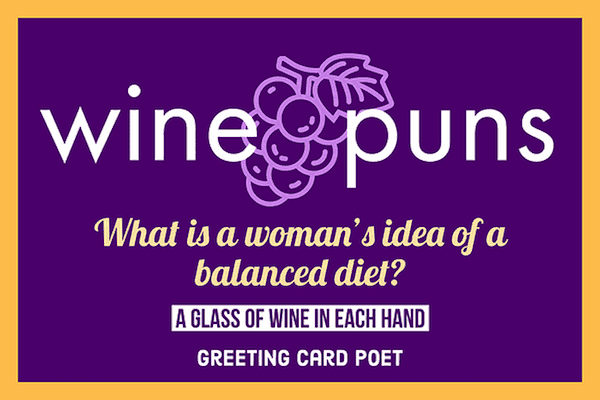 What is a woman’s idea of a balanced diet? A glass of wine in each hand. 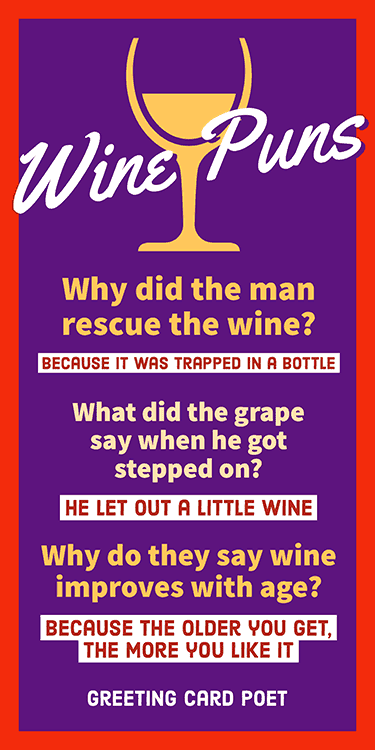 Why did the man rescue the wine? Because it was trapped in a bottle. When do men drink alcohol? What did the grape say when he got stepped on? Why couldn’t the white wine make any friends in school? Because he was too corky. What did the wine bottle say to other who lost their cork? Don’t worry, everything happens for a riesling. What spot did the Malbec come in the race? Why do they say wine improves with age? Because the older you get, the more you like it. Why is it good to share your feelings with a wine bottle? Because it’s not good keeping them all bottled up. Yesterday, I really wanted wine. Today, I’m drinking it. Follow your dreams. Wine: Because guys love confusing texts at 3 a.m.
At my age, I need glasses. My sleep number is 6 – 6 glasses that is. Vino: Because you never got a pony. This pairs perfectly with more of it. I cook with wine; sometimes, I even add it to the food. If kids get an ice cream truck, adults deserve a vino truck. How much is the rent for this amazing apartment? Ma’am, this is the wine aisle at a liquor store. You’re on our Wine Puns page.